If you've been using Windows Mail (installed in Windows Vista as the successor to Outlook Express), you should seriously consider migrating to a webmail-based process instead (such as Gmail). If you do, then you may already have discovered that Gmail has features which allow you to import your Windows Mail contacts, and to setup the email accounts previously under the control of Windows Mail. This page takes you one stage further: how to transfer your old emails from Windows Mail to Gmail as well, and starts with the assumption that you already have a Gmail account. 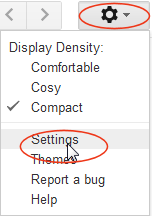 Start by clicking on the Gearwheel towards the top right of the Gmail page, and then select Settings. 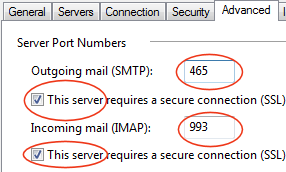 Next select the Forwarding and POP/IMAP tab, and click the radio button next to Enable IMAP. Then click on Save Changes at the bottom of the page. Set up your Gmail account in Windows Mail. Click through Tool | Accounts | Add | Email Account. Enter your Display Name (typically your normal name and surname or as used when you created your Gmail account). Next enter your Gmail address in full. 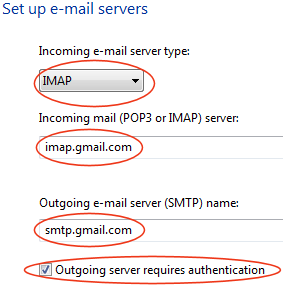 In the "Set up e-mail servers" dialog box (see right), select IMAP from the first drop-down box, and in the following boxes type in imap.gmail.com for Incoming and and smtp.gmail.com for Outgoing mail respectively. Click the box "Outgoing server requires authentication" and click on Next. In the next dialog box, enter your Gmail address in full as your Username, and then enter your Gmail password; tick the box which ensures Windows Mail will remember the password. In the next dialog box, tick the box against "Do not download my email and folders at this time", since the setup process is not yet complete, and click on Finish. Back at the Internet Accounts screen, select the imap.gmail.com account just created and click on Properties then on Advanced. Set the values shown on the right and then click on OK.
Back at the Internet Accounts screen, click on Close, and when asked if you would like to download folder from the server you added, this time click on Yes. This will simply download the existing folders structure from your Gmail account, but not the emails within them. Copy Windows Mail emails to Gmail. The image above from Windows Mail shows both the Local (i.e. Windows Mail) folder structure at the top, and the Gmail structure below. To copy an email from the local Inbox to the Gmail Inbox, hold down the Ctrl key on your keyboard while you drag the email from one to the other as shown. Note the "+" sign against the Windows arrow as it touches the Gmail Inbox: this signifies that the action is a copy. If you prefer to move the email instead, just drag without holding down the Ctrl key; however this is probably a little risky since you may lose the email completely if the move action fails. You can replicate your Windows Mail folder structure in Gmail from within Windows Mail; typically you would do this before copying emails across as described above. 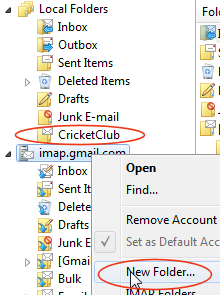 In the example on the right, a folder called CricketClub exists in Windows Mail which we wish to replicate in Gmail. Right-click on the imap.gmail.com line and select New Folder. In the next box, type in the name of the folder and then click on OK. If you wish to review the result in Gmail in your open browser window, you may have to click on the relevant Refresh icon first. To copy the contents of the CricketClub local folder to the new one in Gmail, follow the steps at 3 above but select the local and Gmail CricketClub folders as the respective source and destination. If you have a large accumulated set of folders and emails in Windows Mail, it may be better to be very selective in choosing the folders you choose to replicate, and likewise in the emails you choose to copy across; otherwise the migration may well take a very long time. In any case, copying every email (often with very large attachments) may well result in a severe reduction of your allowed Gmail storage capacity. Once you have created the required folders in Gmail and copied across the emails you really need for further reference on-line, you will still have access to your Windows Mail should you need to come back to any emails not copied to Gmail.